Online dices for those who like to push luck and train the memory! Farkle Dice Game is the game-app which is always with you, anytime you like. You can play either with friends or with computer, depending on your mood. 6 dices and the endless number of combinations are for you! Throw 6 dices in each round. If any combination drops out, you put aside these dices and throw the rest of them one more time. For each combination you get the points. If you throw no combination during a round, it is Farkle - a loss. If you lose 3 times in a row for some reason, then besides getting any points you lose 500 points from your savings. If all 6 dices are formed some combinations (Free Roll), you can throw 6 dices one more time in the SAME round, i.e. you get one additional extraordinary turn. Farkle Dice Game has 3 game modes, each of them will help you to distract yourself from the routine and to train the brain. The first mode is a single game. Here you form your goals and make bets. For 10 rounds you must get a certain minimum amount of points. Get the prize only after passing the task. The more global goal and larger the bet, the grater will be your winnings. Tournaments is the mode for several players. For all of you there are the task and bets. The winner is who make the task first. But the winner is not the only one. There are several medal places, each of them consider to have some prize. A tournament can be play for an hour or last for a week! The most interesting is online-game in real time against another player. You play 1 on 1 and you have the same goal: to get 5000 or 10000 points for unlimited amount of turns. Thus, as a rule, it’s hard to determine the winner till the very end of the game. They are very familiar to all poker players: you need to throw dices with three or four identical numbers, three pairs or two triplets with the same numbers and also six different numbers at one time. The last option (six different numbers at one time) is the most profitable, it brings the biggest amount of points. Improve your result with the help of different “assistants”. Farkle Dice Game is a game not only for points but for money. You can get points by throwing winning combinations in different game modes and by using free bonuses or buying them for money. One of the assistant which helps to cancel the last losing combination and improve round result. With the help of this assistive function you can get an additional extraordinary turn with all 6 dices. 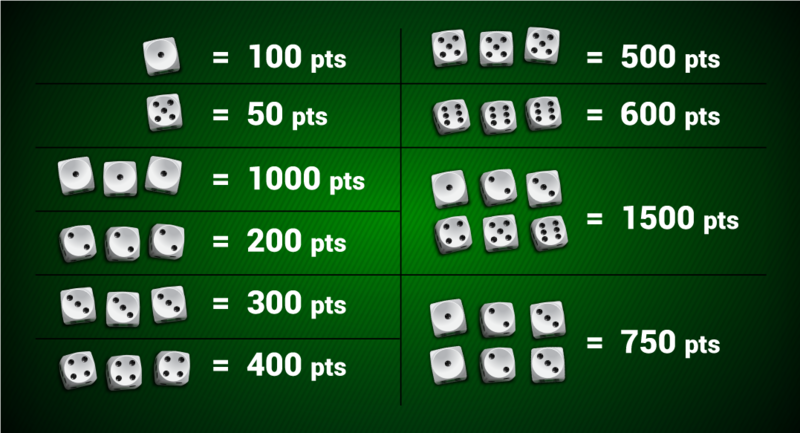 This function allows to double the amount of points in current round and influences the game outcome generally. The doubtless plus of online-game is that you can improve your results and status with the help of different bonuses and assistants. Earned points or bought counters are not the only numbers on your smartphone’s screen. With the help of them you can buy different Power Dice which will improve your results and increase the amount of points. With the help of points you can also indicate your game status. For example, buy game dices and a glass with the personal design. By these attributes other players see your status. Every day one time per several hours you can “go” to special game hall and participate in free counters draw. Actually, these counters may be used for bets, buying of game bonuses or personal attributes. It's time to play the best dice game!